...if tightening the rudder lines could do it, that is even easier. You describe the issue correctly, it just won’t hold a course. Is there possibly a YouTube which shows how to adjust the slack? "Both rudder controls in the 2011+ Oasis are synchronized so what you get with one control should be similar to the other controller. That being said, the correction procedure is the same for all Hobie rudders. I adjust the rudder at the rudder, not the handle. Visual position of the handles is irrelevant; even sweep of the rudder is what you want. 1. With the rudder down and locked, turn the handle (not the rudder) full left and full right. Note the difference in rudder deflection. 2. 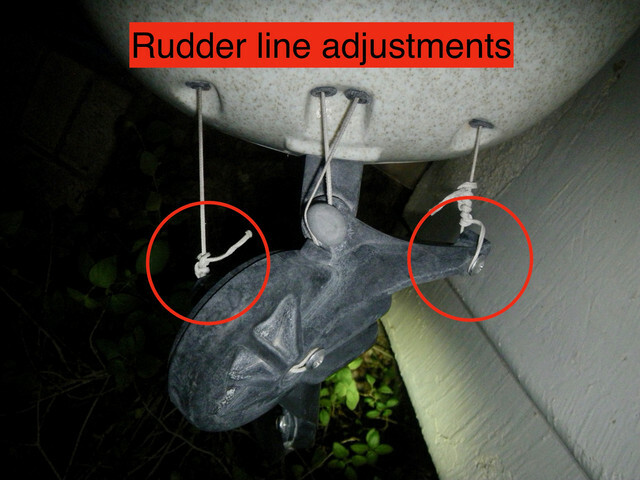 If there is any slack on the deflection lines at the rudder (with the rudder down, locked and pointed straight back), loosen the Phillips head screw on the side of the rudder that has the least deflection and take up the slack. Turn the handle again left and right and see if there is still a difference in rudder deflection left and right. Just by making the line taut this will improve the responsiveness and tracking. FWIW: Turns with the Oasis will be sharper with one set of fins up and one down. Back set down and front set up gives the sharpest turns; Both sets down or actively pedaling give the broadest turns. This is because the fins act as a fulcrum and the shorter distance between rear fins and rudder provide the shortest fulcrum." ...further to the rear the greater the authority a skeg has (ie better tracking per size) that said a kayak pivots around the nose not its center, so a more forward placed daggerboard/skeg will help tracking. Difference is it has to be larger, bringing with it resultant drag. Downside of a rear mounted skeg is it limits manouverability, making it harder to "slide' the back around. Similarly, the rudder limits turns while paddling, but most of the Hobies (except the Adventure / Revo 16) can be "edged" to make small directional corrections with the rudder down. ...next resort is drop the rudder and either let it drift free so it dampens, but doesn't stop turning. Final resort wedge a cloth under steering lever. This will generally hold you in a straight line, but completely eliminate any manoeuvrability. Most of the Hobie kayaks,including the Oasis, use the Twist N Stow rudder. If attempting to trail it, it turns the boat. So it must be either down and locked or up out of the water. Although it's not good to over-tension the rudder lines (they shouldn't have a "twang"), I like enough tension to keep the rudder control from moving on its own. When it is set, it stays in place. If I'm putting something under it to hold it (like a seat strap), I consider that to be too loose. Here's another shot of a front seat solo in the Oasis, but not showing the leg position. His wake shows he's getting a nice bit of speed with a pedal /paddle combo. The rudder is by no means ideal. In addition to limiting turns, it is sometimes difficult to set correctly and the tiniest correction may be more than you want. On the other hand, it's already bought and paid for. With proper set-up and a little practice, it makes for fair paddling tracking on all the Hobie boats that I've paddled with. RR, thanks for the pics. To adjust the slack do I merely turn the Phillips screw in your pics, or do I need to untie, and retie the knot? I ask because from the pi’s it doesn’t seem like turning the screw would do anything other than tighten it? I’m going to take her out of the water next week, just trying to understand what I need before them. Really appreciate all the comments, I have order s couple skegs from eBay, will try several of the suggested combinations. Thx WR, I stopped by the local dealer, they are super, and he also showed be on their showroom model. Perfect Indian Summer weather in Oceanside, took the Oasis out yesterday, paddle only. Fastened the legs together on one of the Mirage drives and put it on the rear location, me sitting in front. Tracked much better, but there was very little wind, and the water like glass. I stayed in the harbor, going too slow to get out past the sea wall. For the first time I took my GPS. Having only paddled a kayak a couple times, I found that using a slower comfort cadence was under 2 mph, if I pushed it I got close to 2.5, but couldn’t hold it. I am presuming this is quite slow. Curious how much might be the kayak (I.e. a large pedal oriented tandem), v me (old and inexperienced)? In either case, good exercise. I am planning on getting a Bixpy jet for the rear well drive location an aid while paddling so I can venture out into the ocean past the protection of the harbor. I’ve got a couple skegs on order from eBay, and just received the two well plugs from Stacktup (thanks), which I plan to attach a small keel/rudder to as well. Just a question regarding the flaming. besides being nervous as hell. Would an electric heat gun (2000w) be as effective or do I need to use a Propane torch?? Just a question regarding the flaming. Would an electric heat gun (2000w) be as effective or do I need to use a Propane torch?? According to the link below, the propane torch provides highly reactive compounds that create a chemical reaction on the surface. In theory it sounds scary, but in practice, it's easy if you pay attention to what you're doing. Always best to practice on some scrap like a plastic bucket lid, etc. Once you see that the plastic doesn't melt, you'll gain confidence. I prefer a weed burner to a small propane torch if treating the whole hull. For small areas, any propane torch will do. Just sweep by the area without pausing and it will look like nothing happened. If it shines, you did too much. If water doesn't bead on it, it's done. Most importantly research and practice proper paddle control techiniques. It doesn't matter that you aren't paddling a surfski or K-1. It doesn't matter that you're not using a "wing" paddle. You don't have to be a racer to benefit from this, The technique teaches efficiency and power. You'll be amazed at your potential, even at your "advanced age" with a little practice and refining of your form! There are other excellent videos as well. 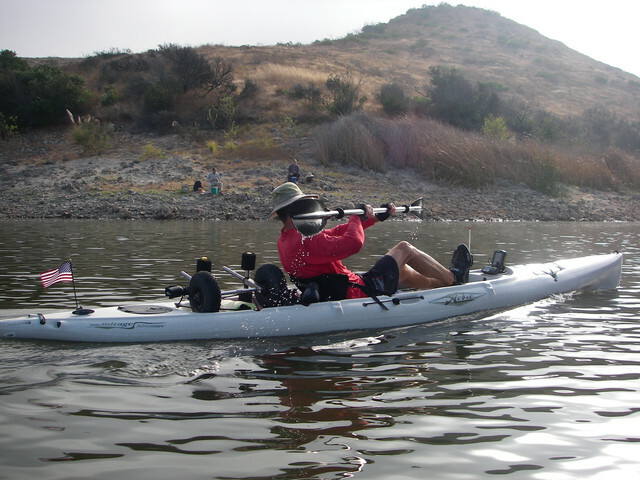 Using a gps while practising paddling techniques is a huge advantage. It only takes a drop off in attention or slacking off with technique and the speed really drops..Even if you are not after speed records once you have nailed efficient paddling instinctively it is surprised how long distances can be relaxing rather than a slog. My training routine is flat out up river for 1 hour to see how far I can go. Then on the way back I weave and slalom all over the place practising edging/sweeps/rudder stroke combinations. These combos take practice until it stops feeling like rubbing your tummy and patting your head at the same time. Nail your technique on flat water as it is much harder in open choppy weather. Sorry, I haven't checked in for a bit so didn't see this. GWFL, your classic hull has such a wide center area that I wonder if the keels being placed so far outside might no work as well as on the Revo/Adventure hulls, but if you feel a difference in light winds it must be working a bit. Maybe adding 2 more closer to the stern (similar to some surfboards) may have a more pronounced effect? Well, the reason I put them in that spot was it seemed like the farthest back I could put them and still have them in line with the centerline, more or less. Your suggestion is interesting but I think if I put a pair more to the stern they would be too angled but I dunno. I do think they make a bit of a difference in some circumstances but it's hard to know for sure. I have noticed a couple references to using "thigh straps" on a mirage drive Hobie due to lack of good foot rests. Is there a specific product for my Oasis? Or do I need to add attachment points, etc? 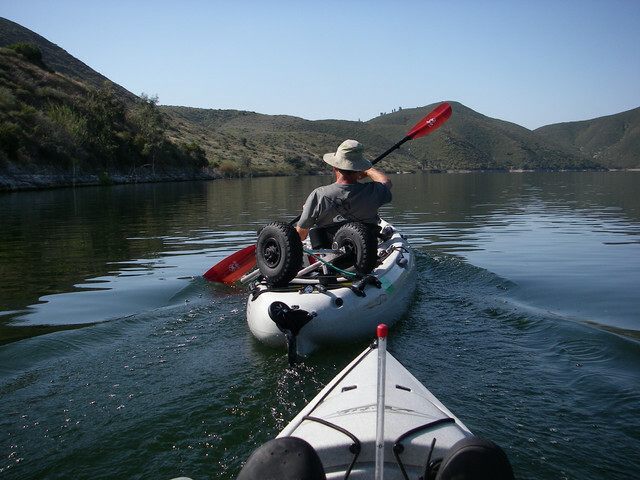 Im going out later today, plan to try paddling with a mirage drive installed (in the same position I sit in. I might install the rear MD as well? Simplest form is use a tie down cam strap looped between padeye at front of tankwell where bungie attaches, to a padeye just in front of mesh pocket. You may have to add a padeye if non present. Stick your thighs under and then tighten. When not using simply tighten so its taunt and doesn't get in the way. I always wear paddling pants so dont need bulky pads to prevent chafing. I purchased a 6” high skeg and glued it to the drive well plug for the rear drive well in my Oasis. Yesterday I went out using the mirage drive in the front and tried paddling in coordination with pedaling. As mentioned, it’s a bit of a workout, but not as tough as I imagined. I like it and will work on technique. The stitching on of the straps on my seat pulled loose, really uncomfortable . I’ve ordered a aftermarket seat to try. (Surf to Summit GT Exhibition). Hope it is more comfortable. With the single skeg I still had issues getting it to track straight in the ocean, although not a serious problem. I find the swells, particularly leaving the harbor sea wall, seem to steer the kayak on their own? Since I am new to this, I can’t tell if this is normal?